Newly renovated in 2015, the SLO Skate Park is a skateboarder’s dream. This $2.2 million, 15,000 square-foot skate park features one-of-a-kind ramps, stairs, rails, and three bowls of different depths to accommodate all experience levels. Attracting visitors and locals alike, the SLO Skate Park is now a top attraction for skaters and families, hosting various event throughout the year. Helmet, elbow and knee pads are required. Coasting devices permitted are limited to skateboards, inline skate and scooters. The SLO Skate Park hosts a variety of events, including skate camps, family skate nights, and competitions. For families visiting the area, a weekend skate camp is the perfect way for your kids to appreciate the outdoors while you get to enjoy some “you” time, whether hitting the spa or wine tasting in Edna Valley. Discover more of SLO Skate Park’s unique events listed below. Turkey Break Skate Camp: Turkey Break Skate Camp is a three-day, supervised event that teaches beginners, ages 6-12, how to skate and safely use a terrain park. The camp provides new skaters with the necessary knowledge for safely using a skate park and teaches the kiddos some fun tricks. 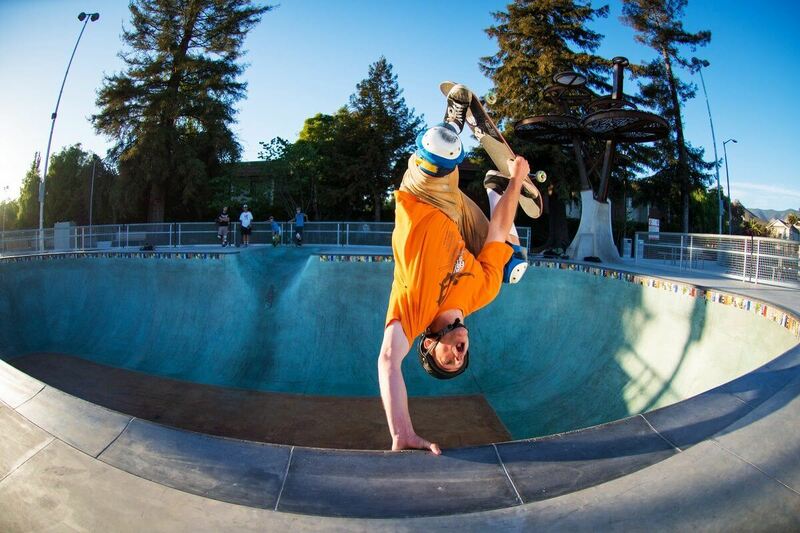 The camp, happening November 19 – 21, is $75 and takes place from 8:00 a.m. – 10:00 a.m.
Monster Skate Series: The Monster Skate Series is an annual skate competition held throughout San Luis Obispo County, providing local and visiting skaters the opportunity to show off their tricks. The competition happens at a variety of skate parks in and around San Luis Obispo, including the SLO Skate Park. Separated into age divisions, the skater who accumulates the most points wins the title of “Champion” at the end of the series. San Luis Obispo County is full of other safe, skateboarding terrain parks, allowing skaters to explore different skate parks within a short drive of one another. Explore the various locations below. A-Town Park stands as the only, public indoor skate park in San Luis Obispo County. With on-site staff ready to watch your kids and equipment available to rent, A-Town Park is the perfect place for you to kick back while the kids get their skating in. The park hours vary by season, so call (805) 461-7606 or visit www.atownpark.com for details. Welcoming skate boards, roller blades, and skates, this 17,000-square foot park is perfect for all types of outdoor fun. Throughout the year, the Los Osos Skate Park is open from 12:00 p.m. until dusk during the weekdays and 10:00 a.m. until dusk on the weekends. Offering a fun, family-friendly environment, the South County Skate Park is open to the public and YMCA members, costing $3 for SLO County YMCA members and $5 for non-members. You can plan a special event or birthday party, sign up for special VIP skate hours or join a skate camp. The park is open from 3:00 p.m. – 5:30 p.m. in the fall and winter and 3:00 p.m. – 6:00 p.m. in the spring and summer. Located a quick drive north on 101 from San Luis Obispo, this park welcomes a variety of experience levels and is open from 9:00 a.m. to sunset every day. For parents looking for a safe skate park in San Luis Obispo, the Templeton Skate Park is monitored on Fridays, Saturdays, and Sundays. Looking for a San Luis Obispo skate shop? You’ve got a hand full of options to choose from. Located in the heart of Downtown San Luis Obispo, Central Coast Surfboards is not only a surf shop, but also a skate shop. It is the perfect one-stop shop for any outdoor enthusiasts in the area. If you find yourself wandering through Downtown SLO, make a stop at Moondoggies Beach Club. A relaxed and friendly environment, this shop allows you to meet other skaters in the area, get all your gear, and get the inside scoop on skating in San Luis Obispo. Skate Warehouse is a specialty skate store, providing excellent, top-of-the-line skate products to visitors. The friendly and knowledgeable staff are wonderful at answering any questions you have or giving insider knowledge on skating in the area.